First time in The Netherlands, I am going to study at Delft. My accommodation is located on Schiedam, just around the Schiedam Centrum, so I plan to journey with train from Schiphol Airport. I plan to bring one large suitcase, one small suitcase and a small-medium backpack. In addition to the baggage, I plan to bring along some used electronics (24" monitor + a printer). Probably in their original carton box package. (#1 The uni provides free shuttle bus from Schiphol to Delft Campus, they will have a welcome session of some sort, but considering my luggage and the fact it's still quite far from Delft to Schiedam, I plan to leave my luggage in my Schiedam first before attending the welcome session). Would travelling with those luggage using train be possible? These intercity trains do not have special luggage compartment. I have to hand carry all of my luggage during around 30-40 minutes journey. Overhead luggage racks are there, but they're small, I wouldn't be able fit my luggage. I will be traveling at 9-10 AM on Monday, standing near the door with my luggage is okay but I am not sure if it's a good idea to travel with that much of luggage while it's near peak hours (crowded. That might disturb other passenger). I checked the NS site and the rules are easy to find, in Dutch. The best I can find in English is this, a link to a PDF file in which I can not find the needed information. Zorg dat uw bagage andere reizigers niet hindert. Plaats bagage in de daarvoor bestemde rekken of onder uw stoel. In de Intercity direct kunt u kosteloos 3 stuks handbagage meenemen, waarvan de grootste afmeting niet meer mag zijn dan 85 cm. Translation by me, so not official: "Take care your luggage is not discomfiting the other passenger. Put luggage in the luggage racks or under your seat. In the 'Intercity Direct' (high speed train) you can take 3 pieces of hand luggage of which the biggest size may not be bigger than 85 cm." Your standard pieces of luggage are within the limits, but the extra boxes are over the limits, but that does not matter as you are not likely to travel with the high speed train. I would still suggest not to travel with more than three pieces, as you will not have help getting on and off the train. One way would be to combine the smaller pieces into one item with a cheap huge bag or by tying or taping them together. I have never seen train staff stop someone getting onto a train or tell them to get off, but it is possible, even when there is no official limits to luggage. Trains are very busy just after 9 AM on weekdays, due to the reduction fare starting at 9 AM, but not as crowded as during the peak time and if you stay in the 'wheelchair' or 'bike' area, unless there is a wheelchair or bike, you will not bother other passengers too much. If you are willing to miss one train if very busy (you should be able to get the next in 30 minutes) I think you can take the risk. Photo of an Intercity double decker train of a kind you might find for your journey. You can just see the bike sign on the door and the one level area next to it. Photo by Willeke, it can be used under the CC rules. 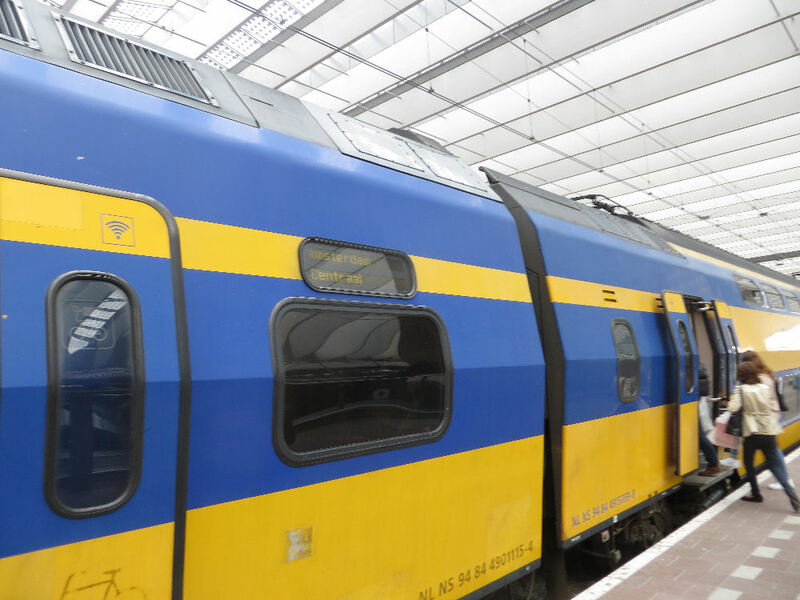 I am just a regular user of the Dutch railways, I do not work for them, so it is my interpretation of the rules as online and as they seem to be for passengers. As you imply that your airline is ok with the luggage you're bringing in to the country, it's pretty safe to assume the NS (Dutch railways) will also be ok with it. In addition, it appears you will be able to carry all your luggage yourself. Unless you carry, like, an inflatable and inflated swimming pool, you should be ok. It will be busy during your scheduled arrival time, so, if you really have a lot of luggage, you might want to wait an hour or two at Schiphol and take a later train. If you still worry about the amount of luggage you have, or will have issues carrying it around, you should consider taking a cab. It won't be cheap (perhaps the going rate is around 100 euros now), but the service will get you straight to your door in Schiedam. Also, behaviour on the Dutch roads is comparatively mellow. Renting a car would be possible. You could get your stuff to Schiedam, drive the car back to Schiphol, and then take a train, probably for less than the cost of a taxi ride. Not the answer you're looking for? Browse other questions tagged trains luggage netherlands study or ask your own question. Global Blue with D visa (Netherlands): possible?